Gazpacho Andaluz is one of my earliest childhood memories of Spain. At the tender age of eleven on my first package holiday to the quaint seaside resort of Tossa de Mar. It didn't matter that the Costa Brava was nowhere near Andalusia, just that I was on my first foreign holiday and my parents encouraged us to try the more Spanish dishes on offer. I also remember other British holidaymakers in the dining room complaining that the food was too foreign. Years later during the summer months I have tried putting Gazpacho on the menu, which has met with mix results. The British pubic haven't quite got their heads around the idea of a cold summer soup, a light refreshing beginning to a meal….so I guess I'm on a mission. To try and encourage more people to try a cold soup I've created this variation on a Spanish classic. 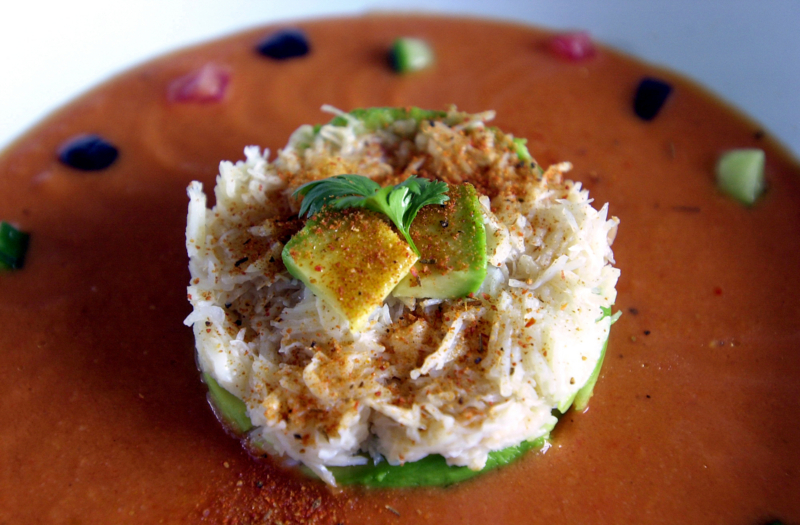 The combination of crab, avocado and the cold, refreshing soup should paint a picture of long Mediterranean lunches dining alfresco, wishing your summer holiday could go on for another couple of weeks. 1.Blanch tomatoes in boiling water for 10-15 seconds to remove the skin. 2.Place the stale bread in food processor and chop until it is fine crumbs. frequently until all sides are charred, and then cling wrap. 4.After five minutes, unwrap pepper and rinse away charred skin under cold water. 5.Cut the pepper in half, then quarters, carefully removing seeds and membrane. 6.Gradually add olive oil to crumbs until fully absorbed, then add the tomatoes, cucumber and red pepper and process until fine. 7.Add tomato juice and tomato puree, then season with salt and pepper. 8.Pass the soup through a fine sieve to make it very smooth, then refrigerate. 9.Remember, the soup should be served very cold and can be thinned down with ice water if it is too thick. 10.To make the tian, place a medium-sized round pastry cutter in a shallow rimmed soup bowl. Neatly place 1/4 of the avocado slices into the ring, then top with 60g of crab meat. Press down lightly with a teaspoon and sprinkle lightly with Cajun spices. To Serve *Use 9inch (23cm) small rimmed soup bowls, like these. Gently ladle the gazpacho around the ring, being careful not to drip onto the tian (fill each soup bowl approximately half full). Slowly and carefully remove pastry cutter, leaving your tian intact. Decorate with tiny dice of tomato, cucumber and black olives (see photo). CHEFS TIPS Although we in the UK drink a lot of red Rioja, the Spanish value much more their white Rioja. A warm rustic bread such as olive bread and perhaps a chilled glass of white Rioja would work well with this dish. The crabmeat in my photo is from the Brown Cornish Crab, but you could also use white Backfin crabmeat from the Blue Crab that these days is sold in most supermarkets.